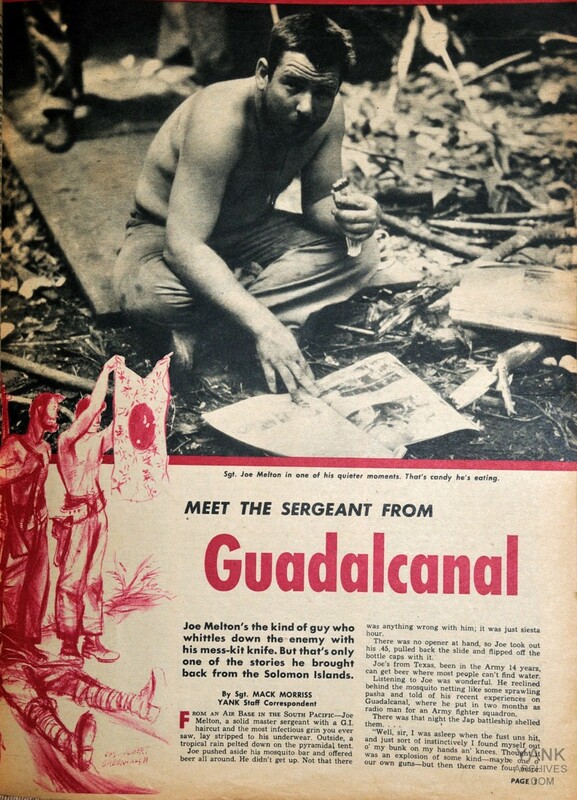 Joe Melton's the kind of guy who whittles down the enemy with his mess kit knife. But that's only one of the stories he brought back from the Solomon Islands. FROM AN AIR BASE IN THE SOUTH PACIFIC — Joe Melton, a solid master sergeant with a G.I. haircut and the most infectious grin you ever saw, lay stripped to his underwear. Outside, a tropical rain pelted down on the pyramidal tent. Joe pushed aside his mosquito bar and offered beer all around. He didn't get up. Not that there was anything wrong with him; it was just siesta hour. There was no opener at hand, so Joe took out his .45, pulled back the slide and flipped off the bottle caps with it. Joe's from Texas, been in the Army 14 years, can get beer where most people can't find water. Listening to Joe was wonderful. He reclined behind the mosquito netting like some sprawling pasha and told of his recent experiences on Guadalcanal, where he put in two months as radio man for an Army, fighter squadron. "Well, sir, I was asleep when the fust uns hit and just sort of instinctively I found myself out o' my bunk on my hands an' knees. Thought it was an explosion of some kind — maybe one of our own guns — but then there came four more. Hell, I knew it weren't no explosion when dirt from them fust ones started fallin' on the tent, but when them next four hit I just zzzzzt! into that fox hole. I ain't sayin' I was fust, but I'll be damned if I was last." Joe rocked back and forth and laughed at the recollection. He tries to make his stories sound as if he was scared to death, but one look at him and you can tell he doesn't scare very easily. "This lieutenant says, 'Well, it ain't but a little further on,' and just then came this tat-tat-tat right up close and he says, 'That's one of ours.' I tell him, 'Sir, I'm mighty proud it is,' and then we got to the place where the radio was. "About that time I hear something go 'boom,' and I look back and there's tree branches a-fallin' and dirt and stuff a-flyin'. Them Jap bastards had put a mortar shell in there and this lieutenant wantin' me to do a highly technical job under conditions like that! Joe had a Jap mess kit and canteen on the table, and he distributed some Jap street-car tickets to his audience. "If the Japs didn't know before, they know now what the American Army's fightin' for — it's souvenirs. Up there, they'll shoot a Jap and he'll jump in the air. Before he hits the ground, the boys will be all over him, frisking him for souvenirs. Damndest bunch of boys you ever saw. One time the Japs tried a push and we mowed down a mess of 'em. Our boys was all over 'em before the last shot was fired. "They find some funny things — American money sometimes, pictures and things the Japs had taken off other marines and soldiers. One boy even found a picture of Hedy Lamarr on a dead Jap. Joe brought out his prize souvenirs — a Jap battle flag and an officer's saber. The flag was made of silk and was inscribed with Jap lettering running in radial lines from the big orange spot in the center. Joe said the letters were messages of good luck written by different people and sent out to the Jap soldiers. The flag was ripped in a score of places by fragments from an 81-mm mortar shell. The officer's saber took the cake. It was a beautiful thing, delicately balanced and with a two-handed grip inlaid with seed pearls. The scabbard and the hilt showed fine metal work and the sword looked very old and very well kept. It was razor-sharp. The web belt that held the scabbard would gird a 27-inch waist. Joe likes to tell how he got the sword. 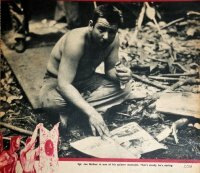 "Why, I fought that Jap officer for eight hours and 15 minutes, and me with only a mess kit knife. Finally, I whittled him down, but I had to stop twice and sharpen my blade. He damned near got me once. If you don't believe it, lookit my head. Joe's G. I. haircut is as beautiful as his gift of gab. Yank Archive curator's comment: This Yank correspondent wrote about Sgt. Melton in a book. I can't find the search tool. This is a fascinating article. Thanks.